Blender is a 3D graphics application released as free software under the GNU General Public License. 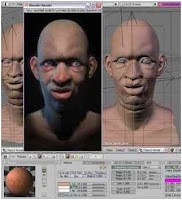 It can be used for modeling, UV unwrapping, texturing, rigging, water simulations, skinning, animating, rendering, particle and other simulations, non-linear editing, compositing, and creating interactive 3D applications, including games. From 2.49 version X-Blender includes the raytracing render engine YafaRay.